Uptrending: Literally hugging trees – Next Hipster Trend is what's HAWT, NEXT! Hipsters may be cool and aloof to actual fellow humans but if it’s non-human, they love it. Frankly, “tree hugger” connotations aside I agree with this trend. Hug ’em before it’s too late. To take this beyond hipster level, peel off your shirt and rub your back on the bark. It’s the bomb. 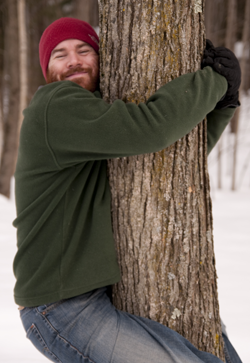 These yoga hipsters think that science has proven that trees have the “ability to alleviate headaches in humans seeking relief by communing with trees.” Hey, if it makes my head stops hurting and it’s legal, I’ll try it.